Education World wants to help you turn your students into the best readers possible. To do that, we have compiled the "Reading Room" a huge list of articles and activities designed to help you teach reading. We start with research-based concepts, ready-to-use tools, and extensions for learning provided by our own "Reading Coach." After that, we have all sorts of useful tools including scripts for reading aloud in the classroom along with other resources. Merely inviting students to contribute verbally when you read aloud to them isnt enough. Take it to a higher level with analytical talk. Id like to suggest that teachers create a read-aloud environment thats a combination of enticing entertainment, skillful modeling of comprehension and thinking strategies, and just plan fun. In education, micro-texts refer to small, targeted bits of a book, essay, poem, newspaper, online publication, or other text. A micro-text can be a single phrase, sentence, or paragraph. Its selection for teaching writing depends not only on brevity, but also on its content. The 2005 National Assessment of Educational Progress reports that less than one third of U.S. high school students read or write at grade level. What can local schools do? Revision is the second most important part of writing (after the idea). Revising denotes stepping back and looking at contentremoving a perfectly good sentence because it doesnt belong, adding details or clarification, tightening language. Good writing doesnt start with formulas and formats. Thinking, defining what the writer wants to say, planning, and exploring -- that is where it begins. Use these strategies to help students realize they have powerful, important things to say. Includes pre-writing tips for preparing for the SAT essay. Skill-based instruction is important, but we also must include the essential element of motivation. Convince students that writing is worthwhile and that their oral vocabulary and reading experiences give them tools to express themselves. Their skills will grow. Encourage parents to include reading in their summer plans, and help them keep their kids reading by making summertime reading different than that stuff I do at school. This article explores how to teach paragraph structure and use of details to support topic through the picture book, When Jesse Came Across the Sea, by Amy Hest. These classroom-ready tips focus on the most neglected area of fluency -- expressiveness. Improve your students fluency b providing opportunities for them to practice phrasing, expression, emphasis, and volume. 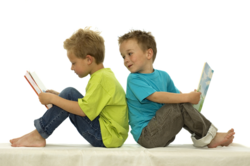 Childrens picture books can be used effectively to teach many of the core standards. Learn which picture books you can use to teach about story elements, literature genres, and writing. Do your students use specific strategies during times set side for strategy instruction but fail to use those same strategies in independent reading? Help kids make the connection between instructional strategies and independent reading with Tools Of The Trade. Researchers Irene C. Fountas and Gay Su Pinnell identify the ultimate guided reading goal as helping children learn how to use independent reading strategies successfully. Discover three tips for making the most of guided reading in your classroom. No matter what their ages, children benefit from independent reading. Join the Literacy Ambassador, Cathy Puett Miller, as she walks you through a practical, easy-to-implement strategy for sending students off into the world of independent reading with a goal and a plan. Included: A step-by-step 4-6 week independent reading plan for students in grades 1-12. Build vocabulary, fluency, comprehension, and research skills with a single tool -- an effective, engaging, irresistible classroom library. Cathy Puett Miller focuses on that often-neglected area of the classroom, as she explains how to give your classroom library new life and make it work for your curriculum and your content goals. Who's On Your Reading Team? The new year is a time of reflection and a time to set new goals for your students and yourself. Think outside the box to identify resources that can make the difference between success and failure for struggling readers in your classroom. Literacy Ambassador Cathy Puett Miller investigates the use of realia and small group discussions to help students connect reading content to their own experiences. Included: Plenty of practical, use-in-the-classroom-tomorrow ideas. Explore the value of intrinsic and extrinsic motivation in today's classroom. Cathy Puett Miller provides classroom-ready tips and ideas to turn all students into readers. Included: Resources for future reading. Cathy Puett Miller explores the importance of reading aloud to students. Sprinkled with the best read-aloud titles, her step-by-step reminders give teachers powerful tools for building comprehension, improving vocabulary, promoting active thinking, and connecting lessons to life. The Reading Coach discusses multiple groupings and explores how you can use small group instruction and learning circles to engage every child in grade-level experiences. Learn why phonological awareness -- the understanding that speech and the sounds of language can be broken into smaller units -- is important to all emerging readers. The pace of instruction seems our first enemy -- making it imperative that we create multiple opportunities to enforce what we most want children to learn. Discover how to make every minute count in your classroom. Did you know that student vocabulary should increase by 2,000-3,000 words a year -- and about 400 of those words should be taught directly? But how do you do it? What activities effectively build student vocabulary? Try these tips from Cathy Puett Miller. Engaging all students in active, thinking, reading is vital. Centering reading around student interests, motivation, and self-concept is how we give every student a reason to read. Cathy Puett Miller discusses a multi-faceted approach to teaching comprehension, including five additions to the NRP's suggested reading curriculum; additions proposed by Michael Graves, University of Minnesota professor and researcher. Now that the school year is nearly over, the time has come to reflect upon the past year, and honestly assess what we did well and what we can do better. In this column, Cathy Puett Miller provides checklists for both teacher and student self-assessment. Make it your goal this year to transform your classroom into one that has positive assessments, and strong and engaged learners -- by declaring reading an empowering, engaging, life-enhancing experience. Highlight the power of reading at home with your parents and students by setting up your own "Is Your Home Reader Friendly?" program. Are you tired of "What I Did on My Summer Vacation?" Do you want to move your students beyond weak, formulaic writing? Cathy Puett Miller tells you how. Make reading and comprehension meaningful and fun for students with three dozen complete scripts that provide opportunities for students to read literature for expression. Students love Reader's Theater! Bernard, a shiny yellow school bus hopes a coat of paint and new wheels will make his young riders sit up and take notice, but he finds them infatuated with fast cars instead. Can Bernard's buddies convince him he's special? Zoe Brown thinks her assignment for her classs Web site project is boring. But she changes her mind when her research takes her to an unusual site full of important information. When his teacher assigns what seems like a simple writing exercise, John discovers hes out of ideas -- until characters from his imagination help him overcome "writer's block." When a fifth grader has an unusual event with alphabet soup, he becomes a "spelling ace," and a spelling bee is coming up tomorrow! But is his "spelling spell" a blessing or a curse? As a school celebrates its 100th birthday, workers find a large box buried on school grounds. Inside is a paper on which is written a century-old code. Can a group of students decipher its secret meaning? On their way to grab a snack in a supermarket, two siblings encounter some talkative produce that persuades them to choose fresh, healthy alternatives to chips and cookies. A wise Coyote outsmarts Earths selfish Fire Beings to bring warmth to everyone. A wise old woman and some talking eggs teach a self-centered girl that a mean disposition and greedy nature can leave one speechless. A Red Dragon tells the animals he will fly them to another world, but the trip ends in disaster. A sneaky spider is undone by greed. When they learn that a new classmate was bullied for wearing shoelaces with unusual colors, two students create a unique plan that rallies everyone in their school to take a stand against bullying. Little Gerry Green Thumb has applied to become the newest character in Nursery Rhyme Kingdom. Will the admissions committee look beyond his unique appearance and accept him into their group? An encounter with a lunchtime bully leads one boy to join the crusade against hunger. But can Victor's work with the food bank -- and his new perspective on hunger -- turn Bull around too? Neila, a visitor from another planet, stops in a small town and visits a store, library, school, restaurant, gas station, and bank. Everywhere she goes, Neila's confusion and odd behavior cause chaos. To mark the 50th anniversary of Symphony Land's world-famous Classical Music Festival, some musicians want to play modern music; others want to stick with the traditional. Will the dispute stop the music? As the holiday season approaches, Trevor Turkey makes a shocking proposal. He calls for a new law that would take turkey off the Thanksgiving menu -- and put an end to a beloved (by almost all!) national tradition. The Strange Case of S.C.
A doctor invites the family and friends of S.C., a patient with Hectic Holiday Disorder, to share their story with a scientific panel. Can S.C. be cured of his obsession with the family business? When a feuding cat and dog realize that their family is abandoning them for the holidays, they team up with a mouse named Moose to change the course of events. What transpires is a fun tale of friendship with a twist. When Allie and Scott accidentally take a wrong turn on a class field trip, they find themselves in a mysterious gallery where they learn some fascinating facts about presidents pets! While researching online, Penny discovers a Web site for U.S. presidents. In the site's very special chat room, she chats with former leaders and discovers what they believe are the most important qualities in a president. Two siblings go to the mall to find a special Mother's Day gift for their mom. With help from some unusual sources, the pair learns that the best presents don't have to be expensive or come wrapped in a big fancy box. A quick-witted rabbit finds a way to steal and trick others while evading any real consequences. A wily fox teaches a vain bear a painful lesson. Long ago, a greedy lion hunted more animals than he really needed -- until wise Old Rabbit taught him a lesson. A wise Coyote outsmarts Earth’s selfish Fire Beings to bring warmth to everyone. A curious little elephant asks a crocodile a question that almost costs him his life. King Lawrence and Queen Lavinia have chosen two animal teams to compete in the Animal Kingdoms annual race. To many, the outcome for the contest seems obvious. But a surprising twist brings an amazing finish. When Cinderella's stepmother and stepsisters announce the release of their new book about her childhood, their press conference reveals shocking "truths" about the would-be queen! Can Humpty Dumpty Be Saved? When Humpty Dumpty is injured in a fall, the king offers a reward to anyone who can help save him. Prospects for recovery look grim until twin computer geniuses use technology to help put Humpty back together again. Popular nursery rhyme characters face-off the in the final round of a dance contest! It's a battle of fancy footwork as the contestants vie for a pot of gold. At the end of the show, the winners make a surprising announcement. The hardworking Little Red Hen is a chicken that has laid a golden egg. She has a thriving pastry business and now hopes to relax a little and enjoy her success. But to do that, she needs an apprentice. Who should it be? Queen Beetifah, the leader of a hive near Rapunzel's tower, raps about the princess with long, golden hair who was locked away and found by a music-loving prince. When Uptown Mouse and his cousin City Mouse exchange visits, each finds the other's way of life quite unappealing. In the end, both mice find that home is truly where you make it. At the beginning of the world, there is much work to do. But while others carry the load, the camel refuses to help. So the magical Wizard of All Deserts teaches the lazy animal an important lesson. Its a battle of culinary creativity when a nursery rhyme character competes in an unusual contest against a famous chef on a popular cooking show. The surprising results stun everyone. Take time out to explore some easy-to-use ideas for improving reading instruction and creating an environment where reading is valued. Included: Tips for creating active readers and sharing favorite books. If you want to instill in your students an awareness of the importance of reading, your classroom must provide an environment in which reading is clearly valued. Research indicates that writing, by engaging students in creating and discovering meaning, improves reading comprehension. Teachers who read aloud in class model fluent reading, improve students' fluency, and increase students' ability to understand written text. Eight tips for getting the maximum benefit from reading aloud. Read aloud daily to your students, the experts urge. Reading increases students' knowledge of the world, their vocabulary, their familiarity with written language, and their interest in reading. Sounds terrific -- but when will you find the time? Reading comprehension, like phonemic awareness, decoding, and fluency, can be taught. Here are some ideas for keeping students involved in what they are reading, helping them improve their concentration and reading comprehension. Help your students see reading not as just another school subject, but as a valuable -- and enjoyable -- part of their daily lives. Encourage students to reflect on their reading with these "favorite books" activities. Encourage independent reading by turning reading time into party time. Add another element to your students' spelling practice. Research shows that students gain greater understanding of what they have read when they respond to that reading, especially in writing. In these lessons, students write a letter to an author whose work has moved them. Students read and discuss letters written by young readers to the authors of books that "gave them wings." Students explore letters of readers who have been challenged and/or moved by what they read. A Personal Letter From Lois Lowry. A favorite author encourages students to explore how their reading experiences have changed over time. Weaving reader-response details into a letter to an author helps convey how a book changed the way you look at yourself or the world. Students learn how to weave reader-response details into author letters. How to hook the reader in 25 words or less. Students learn how to close a letter. In this activity, students find better words to complete sentences. Students use what they've learned to evaluate an entry in the Letters About Literature competition.